“By default, companies are built in the image of their founders, which is why it’s vital to proactively introduce diversity of thought… ‘What happens when startups get successful and grow is that they become more and more vulnerable to the attraction-selection-attrition cycle, where people of the same stripes are increasingly drawn to the organization, chosen by it and retained at it. The way to combat that homogeneity creep is to proactively infuse the culture with originals, who have the will and skill to think differently'”. Four principles and six heuristics on hiring. Some of them are counter-intuitive, and all of them turn what we think we know about hiring on its head. 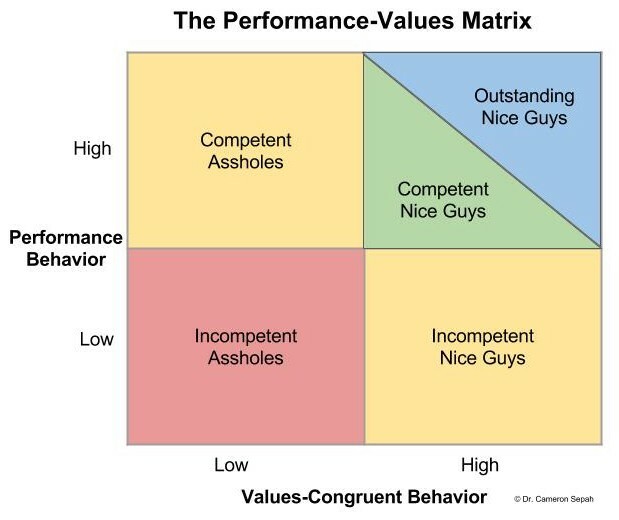 The writer presents a powerful Performance Value Matrix based on the following with the following categories and rules: Incompetent Assholes (Fire Fast); Competent Assholes (Remediate or Separate); Incompetent Nice Guys (Manage or Move); Competent and Outstanding Nice Guys (Praise and Raise). There are myriad costs to keeping employees who engage in demeaning behaviour in an organisation: From how detrimental they are to the mental and physical health of their colleagues, to the overall undermining of learning and organisational effectiveness. “My father always told me to avoid assholes at all costs, no matter how rich or powerful they might be, because I would catch their nastiness and impose it on others. I learned, as an organizational psychologist, that his advice is supported by research on ’emotional contagion’: if you work for a jerk, odds are you will become one”. Think strategically by looking beyond and looking within. Take time to observe what’s going on around and you, and make time to reflect on this and synthesise your knowledge. “…leading people well isn’t about driving them, directing them, or coercing them; it is about compelling them to join you in pushing into new territory. It is motivating them to share your enthusiasm for pursuing a shared ideal, objective, cause, or mission. In essence, it is to always conduct yourself in ways that communicates to others that you believe people are always more important than things”. Great managers are engaged at work – in what they do and with others around them – and take the time to engage their teams, through one-on-ones and fair distribution of workloads. These “seven surprises highlight realities about the nature of leadership that are important not just for CEOs but for executives at any level and in any size organization”. An illuminating read. It may seem counter-intuitive, but there are benefits when talent flow is managed well, with allowances made for movement, instead of an insistence on talent-hoarding. A thoroughly fascinating lecture that discusses how political affiliations are informed by both genes and the environment. “What should we make of all of this? Partly, of course, this is a story of conflicting personalities, of competitiveness between researchers, of academics acting — let’s be frank — like dicks”. How fake news has become our reality, courtesy of Google. “Rather than thinking of liberals and conservatives as being fundamentally different psychological breeds, I now think of them as competing teams. Liberal versus conservative is like Yankee fans versus Red Socks fans. Each has its own flag to which it pledges allegiance. And each side has its own authorities to which it demands obedience”. Why it’s better to be compassionate rather than empathetic.